Hey there #10x10Friends! Ready for week 2 of the #Summer10x10 Challenge? Excellent, me too! 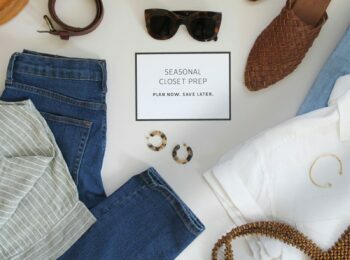 My co-host and stylist extraordinaire, Caroline of UnFancy and I took the weekend off from the challenge, essentially for blogging purposes, but I still found myself reaching for pieces from my 10×10 items all the time. On Friday night I wore my jeans*, flat slides*, a black button down and light jacket to the Hillside music festival. On Saturday I wore my white shorts*, black tank*, a blazer and block heels to a birthday bash and yesterday I was back in my jeans* with a linen button down and block heels. So even though I was technically not sticking to my 10×10 Challenge pieces exclusively they were still the core of my weekend wardrobe. 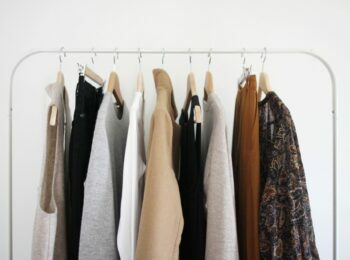 Plus I got to see how they integrate with other favourites in my closet too! For the week ahead I’m excited to put together some outfits I’ve been looking forward to wearing (like this one) and to try out a couple of new ones that I’d never considered until I started mixing up my options. 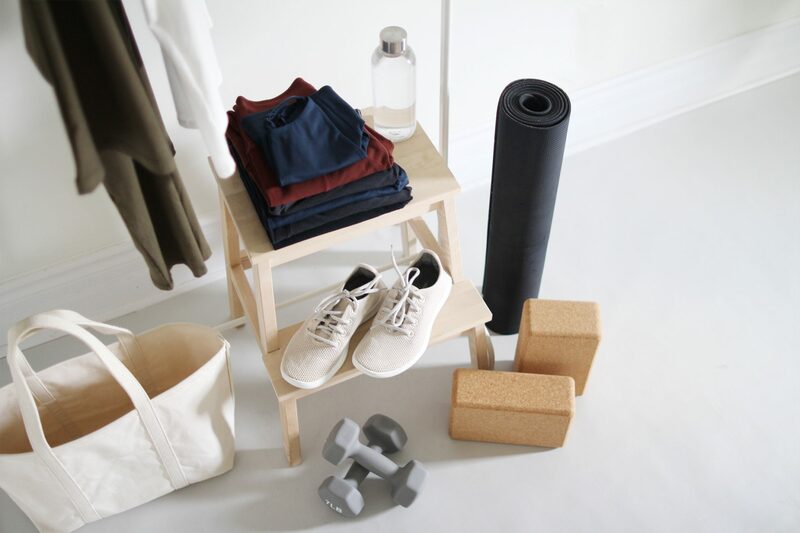 Many of you have been forging ahead and it’s been so inspiring to see how much you’re able to do with your 10 items! So thanks for joining in and if you’re up for it, you’re welcome to start now! Everyone is going at their own pace and you can get all the info you need right here. Now it’s time for a quick look at this ultra basic Monday outfit. It’s nothing fancy but just what the style doctor ordered! TEMPERATURE – High of 25º C with a mix of sun and clouds. ACTIVITIES – Casual day of buckling down in the studio. Then some errands and an at-home dinner with the fella. INITIAL THOUGHTS – After a busy weekend of music festivals, trips to Toronto, birthday parties, suit fittings for Dave and and the usual weekend stuff I was really ready for a low-key start to the work week. I just knew I’d want to be as comfy as possible! Similar to last Monday’s outfit (which involved the same everything except my watch and jeans), this look definitely hits the mark for comfort and yet I felt totally put together and presentable enough to be out and about. 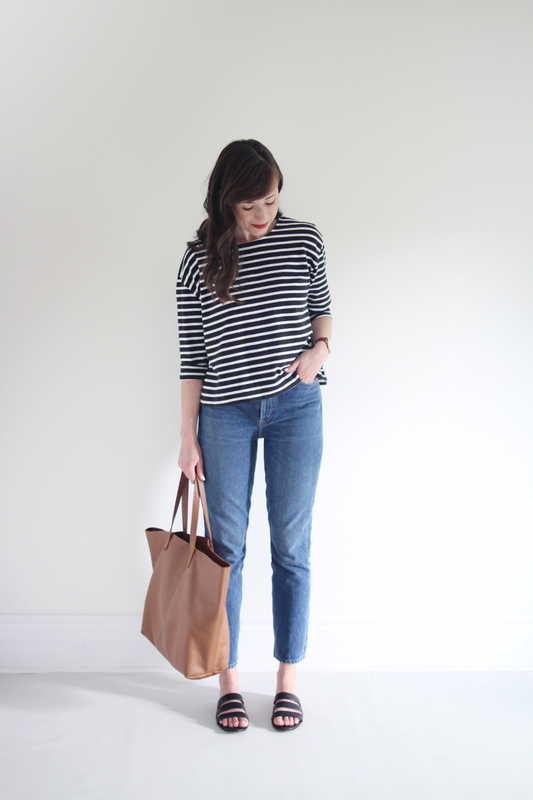 The classic fit jeans and bold stripe top make for a simple but timeless combo, which I’ve always loved. This boxy top works great over a high rise pant thanks to the side vents, which also let the air in and keep it from feeling too hot. Maybe it seems lazy to wear a look so similar to one I already wore in the challenge but I actually think they’re quite different and I kind of love how easy this trick is. Just switch out one element in the outfit and suddenly all the pieces feel refreshed and new! 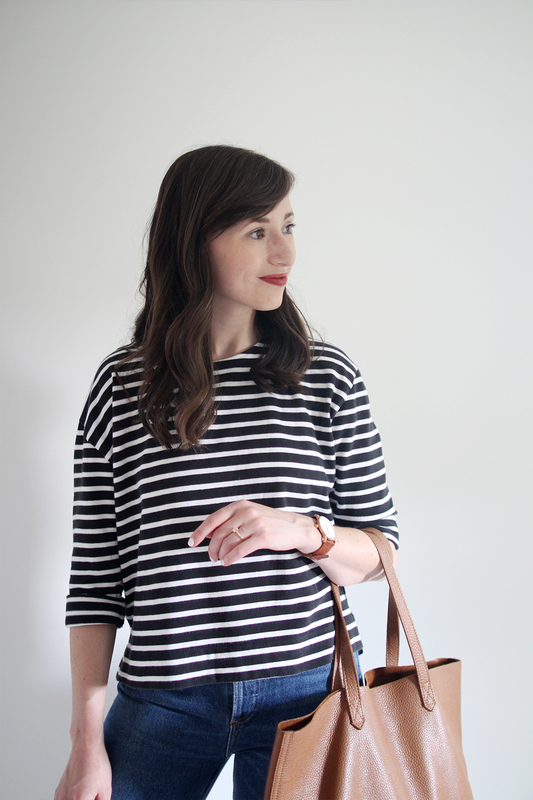 1 | STRIPES TWICE | You might remember this one from last Monday but I love when style tips are applicable to different looks so I felt it was worth repeating! 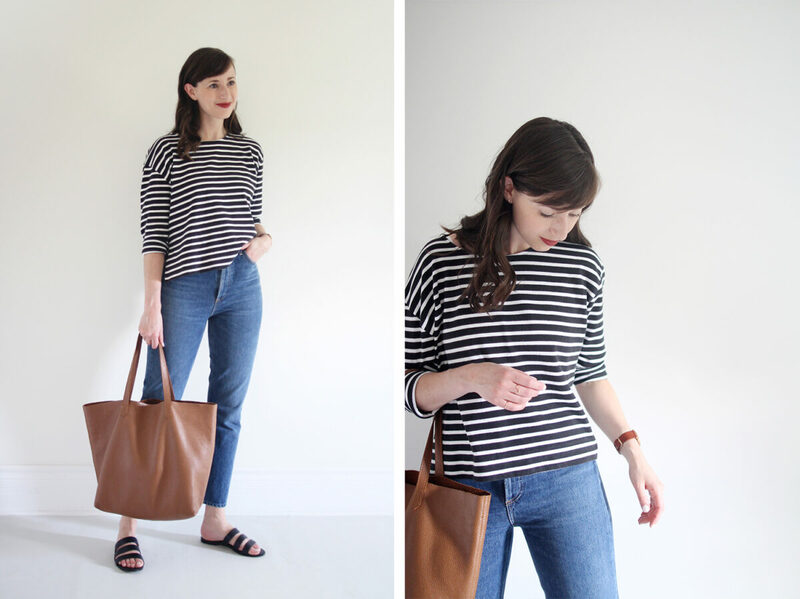 As soon as I got this striped tee and these sandals in the same vicinity I knew I had to wear them together. 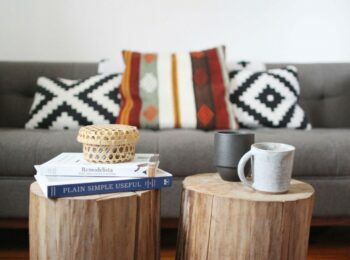 I love the bold stripe and graphic impact they each bring to the look, without being overpowering. They add an element of continuity (you know how much I love continuity) which helps this ultra simple look feel subtly intentional. Look for ways to inject repetition in even the simplest look. It could be like this striped top and multi-strapped sandal. It could be through colour or shape but this trick will help any look feel and look more polished. 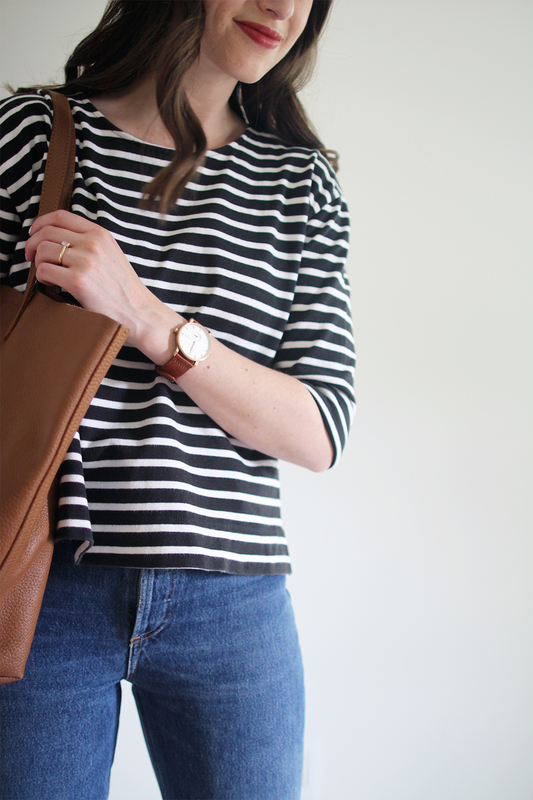 2 | SOFT CUFF | You might have caught this little styling detail in my stories last week but if not, I simply rolled up the sleeves on this striped tee to an elbow length. I found I was pushing them up a lot and this was just a tidier way to get the same result. 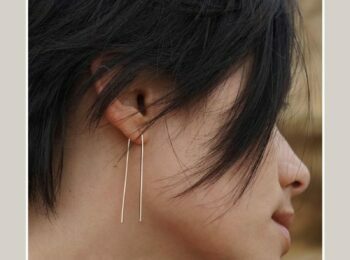 I love how it gives the top a tiny touch of styling that feels a bit more intentional than just wearing them long. If you’re looking to make a long sleeved cotton tee more summer friendly, try rolling the sleeves like you would a button down. Just that small added detail can make a basic top feel more polished and styled. 3 | WATCH IT | I realized that I hadn’t been wearing any of my watches for a while but this look was so plain I felt it needed just one extra ‘something’ and my usual jewelry go-tos weren’t doing it for me. So I grabbed this simple watch with a cognac band and it was the perfect addition to pull everything together. Plus, I won’t need to dig through my giant tote to find the time on my phone, so it’s pretty practical too! Sometimes all you need to make an outfit feel complete is a hint of colour via something a bit unexpected like a watch. Additionally, just because you don’t wear certain accessories for a while doesn’t mean you won’t want to again sometime in the future. Hang on to the classics and they’ll always come back into the fold. 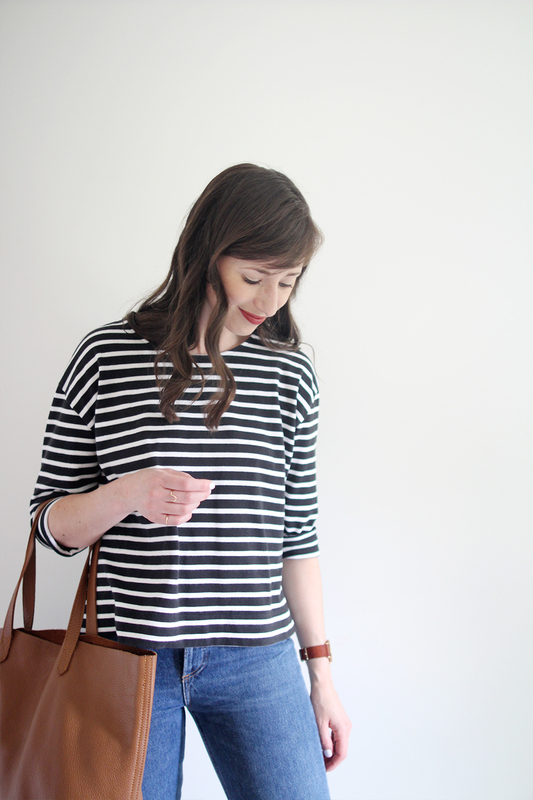 This Boxy Striped Tee has been a staple in my closet since the Everlane released it in the Fall of 2015. I immediately fell in love with the thick cotton, boxy fit, black and white stripes and special side vent detail. Of course the $45 price tag didn’t hurt either. Ever since it arrived it’s been in heavy rotation no matter what season it is. I used to have the lighter version as well and loved it, but sadly it died in an unfortunate bleach splatter accident during our renos. Now, I understand many of you already have this gem in your own closet but I still get lots of questions about it so here’s the low down! FABRIC: 100% Cotton. The fabric is a heavyweight 2-ply cotton that you can wear alone or layer like a sweater which makes it a great multi-seasonal staple. FIT: I’m wearing a size S and I’m 5’7, 125 lbs and have a 26 in waist and 37 in hip. Available in XS, S, M, L. This tee is an iconic style, with a boxy and cropped contemporary cut. The shirt has a drop shoulder, 3/4 length sleeves, 2″ hem and cuffs, and deep side vents. The back hem drops about 1 inch longer than the front. Overall the fit is intentionally oversize but not massive so it’s great for layering or wearing alone. 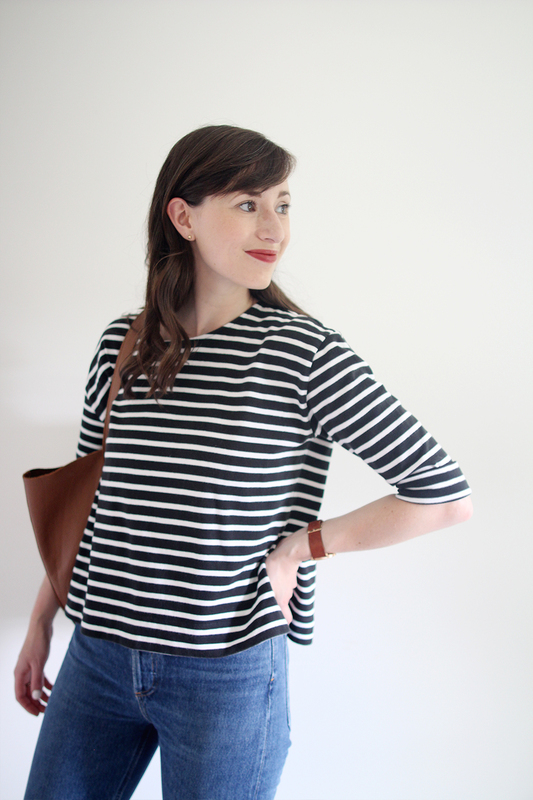 CARE: Everlane says: ‘Machine wash cold, tumble dry low‘ but I would highly recommend you avoid the dryer because I found my tee shrank slightly after I tumble dried it (on low). Now I wash on delicate and hang dry. I’ll even iron it occasionally so it gets a super smooth finish. COLOURS: This tee is available in two colors and also comes in a white and black stripe that is a touch lighter overall. DETAILS: There are lots of key elements that make this tee a special one. The first thing I noticed seeing it in person was the beautiful thick (2 ply) cotton it’s made of. It’s unlike any fabric I’ve worn before. It feels fabulous on and has a great drape to it as well. The boxy cut and thick cotton also help it keep it’s shape really well. The drop shoulder is another element I love on this one. It’s also pretty genius because it means that the stripes on the sleeves line up (closely) with the stripes on the body of the tee, which is pretty subtle but makes a huge difference in how clean and minimal it looks. The side vents are a clever design detail too because they balance out the boxy fit by giving a glimpse of the pant or bottom piece you’re wearing underneath. This is both slimming and practical because it also helps keep you cool in hot weather. 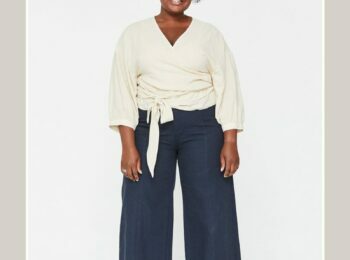 The relaxed fit works great for layering and I’m looking forward to trying it over a sleeveless silk button down like this later this season and over a silky hi-lo hem tunic like this, and even over my jersey tank dress sometime soon. Always happy to answer your questions! If you’ve still got some please feel free to ask away! 3 | CAMILLA SLIDE | NISOLO via GARMENTORY | $88 USD | I wear a 7 | Made responsibly in Mexico | Save $20 OFF your first order when you sign up here. 6 | WATCH | c/o TRIWA | $219 USD | Imported. 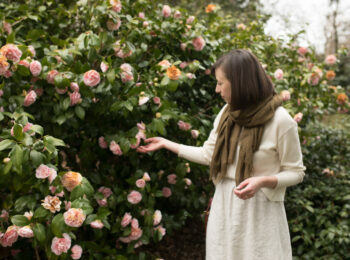 SEE YOU TOMORROW WITH LOOK #7 & DON’T FORGET TO CHECK OUT CAROLINE’S LATEST LOOK TODAY TOO! Tune into my Insta Stories for a look at this outfit in action later today. This post is not sponsored but contains affiliate links. When you shop via the links above I may make a small commission from a sale. 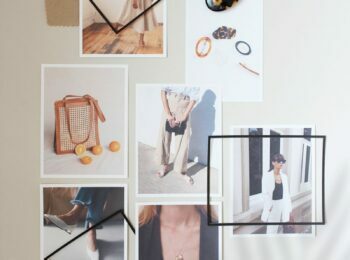 This income helps limit the amount of sponsored content that appears on Style Bee. Thanks a lot for your support! 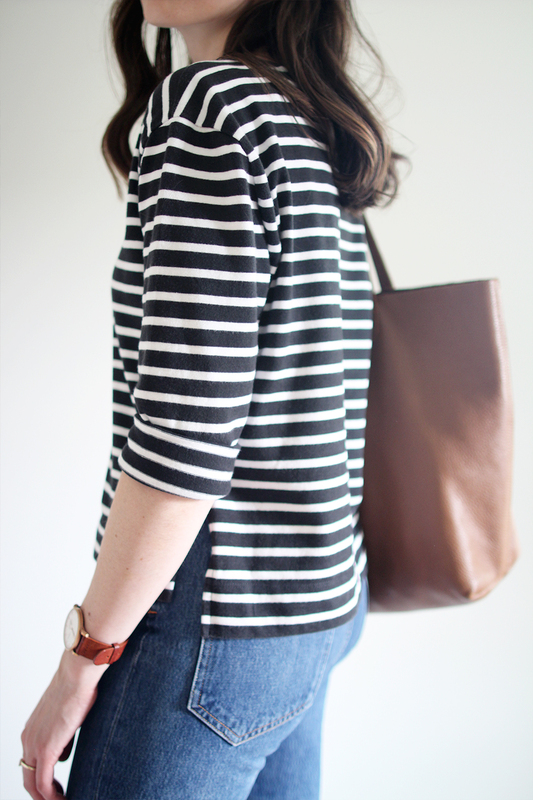 I love a good striped shirt! 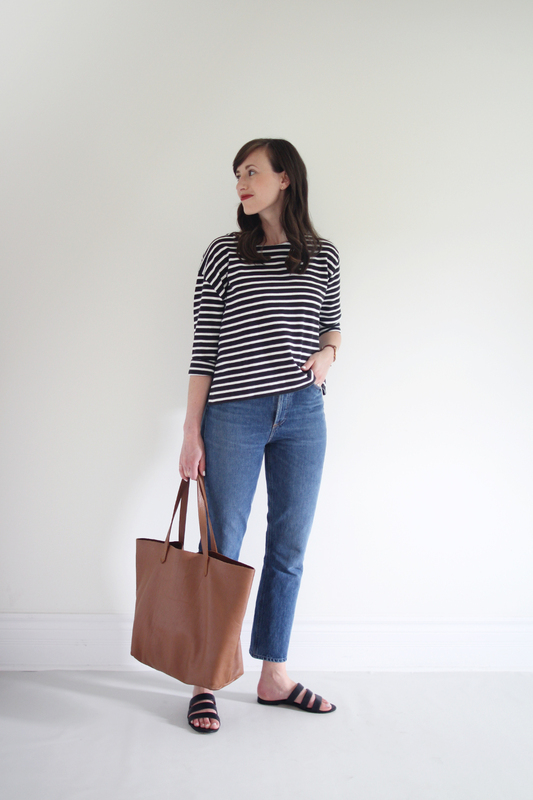 I don’t have this exact one but Everlane’s Gia collection last year had a striped shirt that was similar in style (but lighter weight) and that’s on heavy rotation in my wardrobe. Sounds like you had a wonderful weekend. I have the gray and white long sleeved version of this tee and it’s wonderful too. When the new blue 3/4 Brixton striped one just went on pay what the want part of their website I snagged it for $25 and added some color to my wardrobe. Of course I can’t wear it now because baby bump, so it’s waiting patiently for fall. 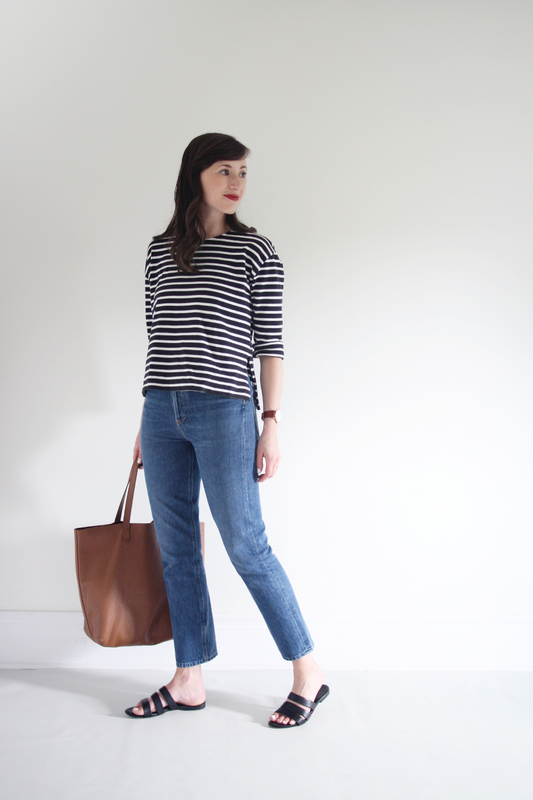 Everlane purchases based on fabric, classic stripes and all the ways to style it. I will say it runs tighter than most tees because the thick fabric of mine (I am 5’6″, 145lbs, 32DD pre-baby), so mine are both mediums.